This easy raspberry wine recipe produces a medium-sweet wine with that distinctive raspberry taste. The fruit is lightly stewed to extract every bit of flavour for the wine and the tartness is moderated with the bananas. Raspberries are a very productive fruit then looked after properly. 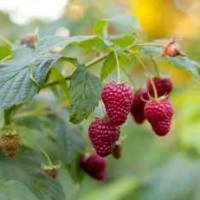 There’s guidance on growing raspberries on the Allotment Garden web site here: How to Grow Raspberries If you find yourself with a glut of raspberries you can freeze them for up to three months. Just pop into an air-tight bag and freeze. They will be mushy when they defrost but that just helps extract the flavour. Put the raspberries into 4 pints of water and heat until just simmering. Simmer for five minutes but do not boil rapidly. Chop the sultanas and mush the bananas and put into the fermenting bin. Pour the simmering raspberries on top. Boil half of the sugar in 3 pints of water for 2 or 3 minutes. Allow to cool slightly and then pour into the fermenting bin. When the mixture has cooled to a little below blood heat, about 30°C, add the yeast, yeast nutrient and Pectolase. Cover and ferment for 5 days stirring daily. Strain and press and return to a clean fermenting bin. Boil the rest of the sugar in 1 pint of water for 2 or 3 minutes and, when it has cooled to room temperature, add to the rest. Cover again and leave for a further 5 days. Pour or syphon into a gallon jar, leaving as much deposit as you can behind. If the jar is not filled to where the neck begins, fill to this level with cooled boiled water. Fit a fermentation lock and leave until all fermentation has finished. Rack, as necessary, checking the wine doesn’t start fermenting again. This recipe for raspberry wine makes about 1 gallon of wine. Thank you for sharing this recipe. I am picking so many raspberries this year and we don’t really use jam. The freezer is brimming with fruit, so must do something else with some of it. I’m looking forward to tasting the end result.